Indian Neem is known to have countless benefits. An active ingredient in many a skin care as well as hair care product, neem has healing properties proven by science. Neem has a wide range of application in beauty treatments and you can use it effortlessly in your daily beauty regime. It is available mainly in three forms; namely, neem leaves, neem powder and neem oil. It is an excellent herb that helps to treat not only skin problems but also scalp and hair problems effectively and safely. • Neem oil for blackheads: If you have blackheads, apply neem oil directly on the area; this will help to reduce your problem to a great extent. • Neem leaves for acnes: Make a paste of neem leaves and turmeric. Apply this pack on your face to treat eruptions, acnes and marks left by acnes. • Neem-Yoghurt pack for sebum control: If you are suffering from excessive oil secretion, try applying neem powder combined with lemon juice and yoghurt. This will reduce bacterial attacks and excess oil on your face. • Neem-Rose Petal pack to get smooth complexion: For getting a clear complexion and glowing skin, free from that oily and greasy look, you may try out this pack. Combine neem powder with yoghurt, rose petal powder and milk. Once it forms a smooth paste, apply it on your face and neck. Wait for fifteen minutes and then rinse with rose water. If you do not have rose water at home, you can wash off with plain cold water. • Neem pack to prevent excessive dryness: Mix neem powder with water and add some grapeseed oil to this mixture. This mask should be applied on face to check extreme dryness. • Neem-Tulsi face pack for pimples: Take neem leaves and grind them. Alternately, neem powder can also be used. Combine one spoon of neem with tulsi powder and add rose water to form a thick paste. Apply on your face and relax for thirty minutes. Rinse with plain water. This pack is effective in treating pimples naturally. • Neem-Cucumber pack to treat pimples and acnes: A cucumber and some neem leaves should to be crushed. A fine paste is to be made. Add some turmeric powder and water to the paste. Apply on your face and leave it on for thirty minutes. Rinse with water. 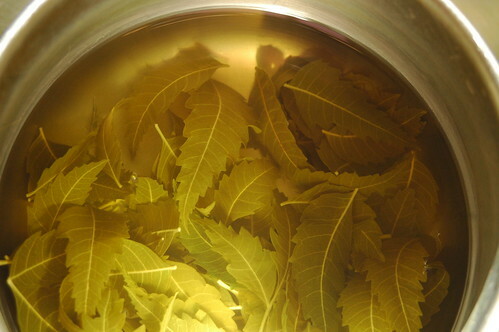 • Neem to treat scalp problems and hair loss: Boil one cup of fresh neem leaves in water. Use it as a hair rinse after shampooing. The antiseptic and anti-bacterial properties of neem help to treat scalp acnes, itchy scalp, dandruff and hair fall efficiently. • Neem oil for hair growth: Neem oil is helpful in promoting blood circulation in your scalp. Use neem oil for massaging hair roots to promote hair growth and solve thinning hair problems. Use a neem based shampoo as well. • Neem pack for dandruff: Mix neem powder with water and apply on your scalp by massaging gently. Keep for about one hour and shampoo. This pack is particularly good for oily scalp. • Neem for deep conditioning: Mix neem powder with amla powder, reetha powder and shikakai powder. Apply this pack on your hair. Apart from conditioning your hair, neem’s antiseptic properties would keep scalp problems at bay. • To purify your system and get glowing hair and skin naturally, take neem capsules daily or chew a couple of neem leaves. Taking neem internally boosts the immunity system. • Take bath in neem water daily for countering mild infections and keep rashes and eruptions at bay. • Neem oil is effective if you want to get rid of lice, dandruff, premature graying of hair, eczema and psoriasis. • Neem has anti-fungal, anti-bacterial, anti-viral and anti-parasitic properties. That is why, neem is efficient in treating a variety of beauty problems. • Neem has exfoliating properties and it is wonderfully suited to cater to the needs to oily skin. • It soothes irritated skin and relieves itches and dryness. • It is widely available in the Indian market at cheap rates. Beauty treatment with neem is easy and cost effective. I dont have any neem tree near my home. :(( do we get neem powder or something? btw if you have some good old phool wala, who gives pooja ke phool for day to day use, chances are he keeps neem leaves also. check that out.. but neem does smell pretty strong. Awesome tips, am saving this page, will try the tips for sure!I have neem tablets , I dissolve that in hot water and use, excellent thing! RATI! this one was for you! is neem oil available in any brand? Jiva Ayurveda also has neem shampoo, great one ! okay! Is that good for oily scalp and dandruff? have u used it? Yess I have used when I had dandruff, it effectively cured dandruff and mostly scalp pimples that I used to get! Check these two sites, you will find detailed info! wow Tapaswini! sounds so good! where do u get it in Kolkata? is it available in the shops in general? No Somreeta I order online, they have option of cash on delivery thing, so I never have any problem! You wont find anywhere in kolkata dear! :-* I would be happy if my info helps you dear! i love neem…it cured my terrible acne last year wen nothing else worked ……..
hahaha Sim! gharwale, baharwale..padosi and tum khud..sab pagal ho jaega! i havent tried it for washing hair.will try now …..
i just crush 4-5 leaves of neem and apply the paste on my acne affected part……. ya Nupur..i have also tried it for my pimples and acnes 🙂 good! Rati my comment waiting for moderation! Never knew neem’s called indian lilac!! hehe :whistle: gr88 post somreeta! Neem is indeed very effective for acne and pimples. I mix neem powder with multani mitti+sandalwood powder+ rose petal powder with a pinch of turmeric and this pack really helps in clearing out pimples and evening out the complexion. Nice post Somreeta! Thnks for the article & reminding of various benifits of something easyily available like Neem.